In a recent auction at the Poly International auction house in Beijing, traditional master artist and calligrapher Qi Baishi (1864-1957) set a new record for the highest price paid for a Chinese artist's work sold at auction. His twelve panel set of ink-brush paintings sold for $141 million (£105 million) to an undisclosed Chinese buyer. The landscape screens painted in 1925 depict lightly washed sublime scenes of nature including mountain ranges, quaint villages and fishing boats. Despite the fact that Qi Baishi's work is little known outside China his works often command high figures at auction, having previously sold for over $55 million. This auction success may soon see itself carry over to Warwick. 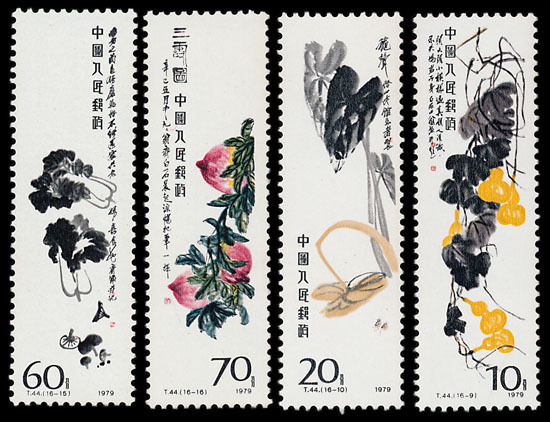 Lots 376 and 377 in our January philatelic sale are representative of Qi Baishi’s work. 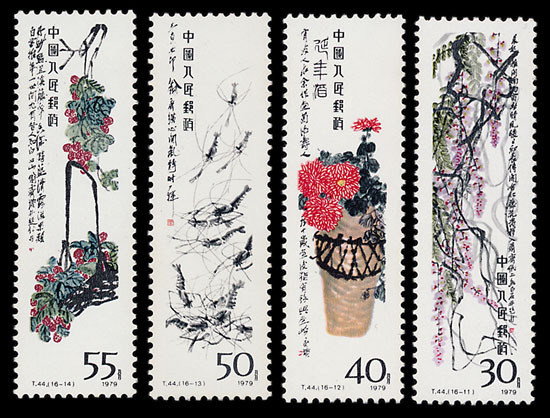 The first lot, a set of sixteen stamps with whimsical scenes of nature against white backdrops, features multiple depictions of flowers bursting with colour as well as feeding squirrels and tadpoles in a mountain spring. 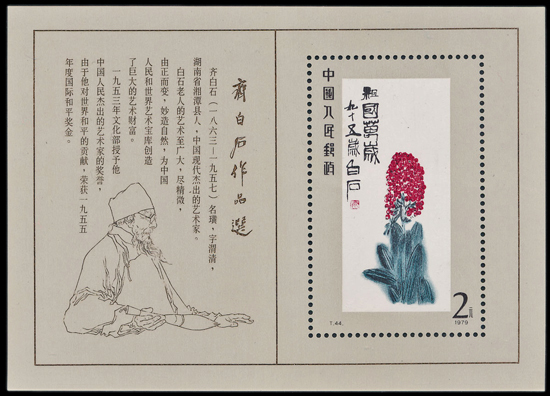 While lot 377 is a miniature sheet featuring Qi Baishi’s ‘Long live Motherland’ a bright red flowering plant that vividly stands out from the white canvas, and a pencil sketch portrait of Qi Baishi by modern painter Fan Zeng. 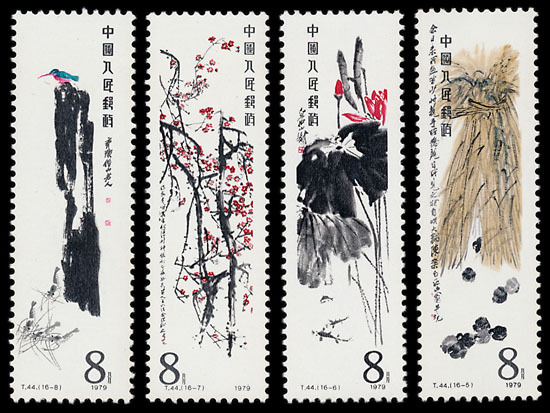 Throughout the course of his life Qi Baishi painted thousands of pictures, effortlessly combining traditional Chinese painting techniques with folk art to create his own distinct style. The stamps – celebrating his career as an artist - stay consistent with the dimensions of his actual screen paintings and alterations to his designs have been kept to a minimum, allowing his watercolours to be viewed as they were intended. As an artist he wanted to express profound meaning through ordinary subjects and the stamps chosen to honour his career reflect this. 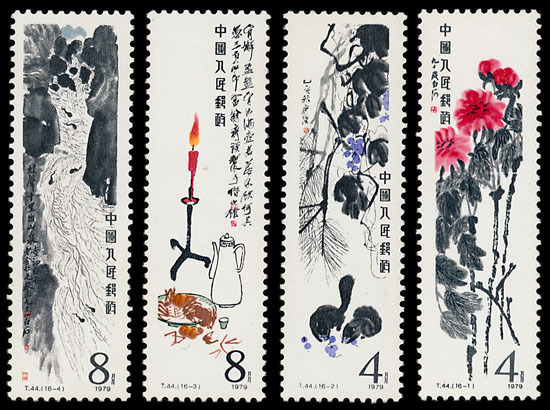 In excellent unmounted mint condition these Qi Baishi miniatures offer you a chance to own your very own Chinese masterpieces for a fraction of the price. For more information on our January sale you can view the catalogue on our website where you can also find out how to place bids. Visit our Facebook and Twitter for updates on all our auction news.